Science Objects are two hour on-line interactive inquiry-based content modules that help teachers better understand the science content they teach. This Science Object is the last of three Science Objects in the Electric and Magnetic Forces SciPack. It explores magnets, magnetic forces, and the relationship between magnetic and electric forces. Magnetic and electric forces are closely related and can be thought of as different aspects of a single electromagnetic force. 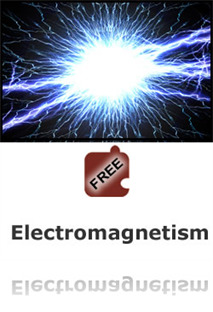 Both electric and magnetic forces are thought of as acting by means of fields: an electric charge has an electric field in the space around it that affects other charges, and a magnet has a magnetic field around it that affects other magnets. Moving electric charges produce magnetic fields and are affected by magnetic fields. More generally, a changing electric field induces a magnetic field, and vice versa. This interaction is the basis of many natural phenomena. For example, electric currents circulating in the earth's core give the earth an extensive magnetic field, which we detect from the orientation of our compass needles. The interplay of electric and magnetic fields is also the basis for electric motors, generators, and many other modern technologies. It all comes together in this final third of the Electric and Magnetic Forces series. I wish I had this resource years ago!! !